Sorry, Ayn Rand, but Mr. Hobson is right. O, but that we had heeded his advice at the Fed instead of embracing hers! O, but if only Greenspan had been a devotee of Hobson instead of a disciple of Rand! Alas, but that is what a good government should do: protect society from the injurious assertions of individuality. This entry was posted in Economics, US Government, World Hellhole Report on 04/29/2011 by deanwebb. I picked up this film at the Half-Price Books this past weekend and enjoyed it greatly. Perhaps “enjoyed” is the wrong word… it’s an incredibly brutal war movie. I should say that I appreciated its importance and scope greatly. It’s a magnificent film and is superlative as a war movie. I watch war movies because of what they have to say about the human condition, both about the soldiers that fight and the people that make the films. I feel that war movies as a genre deserve a system of rating that considers them as war movies, to the possible exclusion of other elements. The first consideration is how much stuff gets blown up. Wars are about destruction, and that has to be depicted strongly, or the film must deliver significantly in other areas. Even if a film is near-perfect in other areas, an absence of massive, cyclopean destruction will prevent it from being a consummate war film. In this regard, Tae Guk Gi delivers. Some would say that it over-delivers. The film has a strong advisory that is warranted for its stark, graphic, brutal depiction of what war can do to a human body. The film does not flinch from hand-to-hand combat with improvised weapons, shells rending bodies, or massacres of innocents. The violence makes it difficult to watch, but compelling as well. There is much to learn in that this is a true face of war, and it is ugly. 2 points for the blowing stuff up. Next, I want to assess the honesty of the depiction of war. Every great war movie is also an antiwar movie. A movie that glorifies an aspect of the conflict is propaganda. Tae Guk Gi glorifies heroism, but on a personal, rather than national level. It questions so-called “national heroes” as fabrications of propaganda, with their actual deeds perhaps best left unknown. Tae Guk Gi is most certainly an anti-war movie. The war moves across Korea and devastates the whole of it. The characters are all complicated, regardless of their side, which aids the impact of the film. 2 points for honesty without propaganda. Third for me is a question of veracity: does it ring true? I’m a military historian, and I cringe at ignorance of history. Ignorance of history leads directly into propaganda and mythology and glorification of war, which there should be none of. Tae Guk Gi is painstaking in its detail, down to the anti-communist brute squads that executed South Korean citizens in liberated areas for suspicion of collaboration with the Communists and the North Korean slaughtering of villagers in the path of the South Korean advance. The uniforms are impeccable and the equipment period- and theatre- accurate. I enjoyed seeing the North Koreans equipped with the proper USSR 1938-era war surplus, as happened historically, along with the evolving quality of equipment for the ROK forces. 2 points for veracity. After veracity, I want to see empathy for the other side. Not sympathy, but an understanding of their motives – empathy. I don’t want the contending army to be simply “the bad guys.” I want them to be the enemy, but I want to see them act intelligently and not be a set of cardboard targets to blast apart. I don’t want to see a film that’s little more than a first-person shooter game. Again, Tae Guk Gi comes through on this count. The North Koreans aren’t idiots. They also aren’t a nameless mass. We see their soldiers, their officers, their prisoners of war, and each character has a memorable impact. There’s also a great Chinese mass charge scene that incorporates CGI and live action properly… unless the filmmakers really did hire 100,000 extras to charge up a hill for 20 seconds… but the scene conveys the idea of a mass charge more than any description I’ve read. I understand the Chinese style of fighting more now. 2 points for the empathy connection. Finally, I need intensity of experience. I need to feel like I’m there, in the midst of the conflict. Tae Guk Gi is excellent in that regard. The cinematography uses a number of artistic touches that again and again put me directly in the trenches, bunkers, and city ruins. Blood, dirt, and bullet casings fly up into the lens, giving me more than a 3-D experience. I travel in time with those touches. 2 points for the intensity, 10 total. Tae Guk Gi is what I would consider to be a consummate war film. It has it all, plus bonuses I did not need to consider because of its attainment of superlativeness without their consideration. This is not a romance. This is not a teenage angst vehicle. This is a WAR movie, and there is much to learn from watching it. If you like war movies, you owe it to yourself to see it. This entry was posted in Ze Rest of Ze Ztuffm on 04/26/2011 by deanwebb. Slavery. There, that was easy. States’ Rights? OK, sure… state’s rights to do what? Oh yeah, own and keep slaves. Economics? I’ll agree that was a reason as well, due to the economics of chattel slavery. The entire way of life among the Southern elites was dependent upon the exploitation of chattel slaves from African peoples. The economic and social pressures from the North threatened slavery as an institution and, by association, the power of the rich white landowners. The Northern elites were pressing their advantage in Congress to turn the South into an internal colony of the United States, and the South objected to their dwindling numbers and the inability to spread the institution of slavery to the West. They could not spread westward because, in their way of putting it, exploiting cheap Mexican agricultural labor was cheaper than owning slaves. With secession, slavery did not have to spread to maintain political power. It also meant less political and economic power for the North, so the Civil War became an extension of USA’s imperialism. The Civil War was a war over the nature of American slavery: chattel or wage/debt? The banks of the North made the Union victory possible by lending money to the USA in the form of a perpetual debt. We are still paying interest on that debt. Therefore, I can conclude that the banks won the Civil War, making the institution of chattel slavery a thing of the past and wage and debt slavery the law of the land. Americans have a disturbing trait in that they do not wish to examine their history objectively. Historians are anomalies among a people that prefers hagiographers and mythologists when dealing with its past. Southerners want their historical forbears to have fought for States’ Rights. Northerners want to have their forefathers to have fought to free the slaves. This in spite of the fact that poor Southern whites themselves seceded from their own states so they would not be poor men dying in a rich man’s war and how Lincoln only freed the slaves in the areas of the nation in which he had no power to do so. This romantic approach to the past extends to all American wars. We have to claim victory in every one of them, no matter what the reality indicates. The War of 1812 was a pointless war, fought to a draw against a distracted Britain. The Mexican War was a theft perpetrated against a weaker opponent, born of a baldfaced lie to Congress: how can we “win” in that situation? The USA lost the Civil War: I told you that the banks won that conflict. The Spanish-American war was another mugging, this time of Spain. World War One was fought to make sure France and England could pay back the massive loans they took out from US banks to buy US-made weapons, so the banks won that one, too. There’s so much mythology around World War Two that I’ll concede to anyone that the USA won it, even though I have some strong, well-formed opinions about that one. Oh, I can’t resist. FDR was trying to get the US involved from the get-go. US escorts tried to draw the foul from German U-boats. The navy posted its fleets forward to Hawaii and the Philippines, provoking a Japan already angered over a US oil embargo. Once in, the USA demanded unconditional surrender, which hastened the Holocaust: the Nazis realized they couldn’t negotiate their way out of things, so they’d have to kill Jews and Gypsies and Poles and Russians and others that much faster, before they ran out of time. FDR didn’t even use US bombers to take out the rail lines bringing victims to those murder camps, even though they could and they knew exactly what was going on. Germany and Japan both eventually surrendered after US bombers firebombed their cities, but the Cold War began as an extension of WW2-era rivalries. I can’t say that the US won WW2, since we didn’t defeat our other main rival, the USSR. After WW2, the USA simply didn’t bother declaring wars, so any reason behind the use of military force became a fiction. The USA did not win the Korean War: China won that one, since it secured the existence of the buffer state of North Korea. The Chinese armies succeeded in driving the US-led forces back to the 38th parallel and held their ground against US and ROK counterattacks. The Communists also won the Chinese Civil War, in spite of US backing for the Nationalist side. The USA lost Vietnam: we exited the war before the inevitable collapse of South Vietnam occurred, but not before we invaded Cambodia and caused that nation to plunge into the clutches of the Khmer Rouges. We did not achieve our goals in that war, so we lost it. I can’t say the US won the war to liberate Kuwait since we precipitated that war by encouraging the Kuwaitis to slant-drill into Iraq and then letting Iraq know we’d not interfere if they sought punitive measures against Kuwait. That war resumed in 2003, with the goal of making Iraq into a US client state: that adventure has failed miserably and US forces remain in a nation they failed to remake in our image. There’s Afghanistan, too: nobody wins in Afghanistan, not even the Afghans. It’s not the “graveyard of empires” for nothing. Our soldiers can fight valiantly: I do not question that at all. What I question is why they were fighting in the first place. The USA has never had a truly defensive war in its history. We rationalize and claim this just cause or that semblance of victory, but there’s really no way our nation can win in such actions. Until we are honest about our history, we cannot hope to be more sober in our use of force. 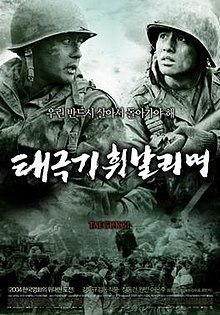 I recently saw an excellent war movie from South Korea, Tae Guk Gi. I say it is excellent because it shows all of the war and does not let any side escape scrutiny. Both sides fight bravely. Both sides commit atrocities. Both sides become confused and paranoid and, finally, reckless in their bloodshed. The victory in the film comes from the main characters’ ability to rediscover their humanity in the midst of the revolutions of blood. There is a strong honesty in that film that I find absent in American treatments of war that tend to focus more on the main characters’ struggles against a larger enemy. There are exceptions in US war movies: Saints and Soldiers, Pork Chop Hill, and Black Hawk Down, but even in those I detect some latent cheering for one side over another. While we’re ready to be honest on a personal level about the lives of the soldiers, we are not yet ready to be honest about the way in which we fight wars or in the ways in which wars have been lost in a national sense. Which brings me back to the Civil War: both sides were pushed forward by their rich men, and it is the rich men who always seem to win wars, for they are the ones that lend the money to fight those wars. They are the ones that own the arms factories. They are the ones that sacrifice nothing and gain everything there is to gain from a war. This entry was posted in Ze Rest of Ze Ztuffm on 04/24/2011 by deanwebb. Worst case: they’re running mates and unify the loony bin vote. Best case: Trump runs as an independent, splitting the whack job camp. I see Trump and all I can think of is, “plunderer!” Like he’d have the interests of normal people in his heart. The man’s a walking billboard for overblown CEOs. I’ve already said stuff about Palin, and that hasn’t changed. So help me, the GOP is doing all it can to get me to vote for Obama in 2012. This entry was posted in US Government on 04/19/2011 by deanwebb. The GOP has a plan. Gut programs to aid the poor, and divert what’s left of them to their buddies in the big insurance companies. Yes, we need to cut spending, and that does include the big entitlement programs. But we do not solve the problems of America by giving more money from the poor to the rich. The growing income disparity in America – and it’s been growing since the Civil War, when the USA took on perpetual debt to fund that war – is due not to the poor being unable to hack it in the real world. It’s due to the way the government facilitates the plunder of America’s poor to benefit the rich. I’ve read books from recent years, from the 1960s, from the 1930s, and from 1902 about the subject. All present telling facts – the same litany of facts, with numbers appropriate to their generation – all decrying the way the government assists large corporations and their directors in plundering the poor of the nation. Republican politicians seem to be the most ideologically predisposed to the plundering of the poor, and the article linked above demonstrates a continuance of that trend. Yes, we need fiscal responsibility, but no, it’s not in continuing to send bags of cash from the poor to the rich. My solution is simple, but revolutionary. Ban all lending of money or property at interest. Ban any practice that amounts to someone earning money from another’s efforts, regardless of what was borrowed to make those efforts. Forgive all debts once the debtor has repaid the principal, and forgive all debts the debtors are unable to pay. Require conscription of personal fortunes in times of war – and we’ll never have another war again if the rich can’t lend money to profit from them. Amend the constitution with Thomas Jefferson’s idea: require the government to repay all debts within 19 years so that those born on the day the debt was taken out will not be involved in paying it off. Yes, this means defaulting on the US debt and that we’ll never be able to borrow money again (supposedly). That seems to me to be a good thing, going forward. We need a new way of living in which we do not permit the exploitation of the poor. That is the true path to fiscal responsibility for the nation as a whole. I’m ready to ride a bike 6 miles to work when gasoline is unavailable to us – and that might not be so bad, either. It’s not the easiest world, but it’s a brighter future than one in which debt looms over us all and the rich continue to oppress the poor. This entry was posted in Economics, US Government, World Hellhole Report on 04/13/2011 by deanwebb. One should always take time to stop and smell the roses. I’ve got a lovely little rose bush by my driveway that’s been putting out roses every spring for over 20 years. Thank you, rose bush. This entry was posted in Reason to Live on 04/11/2011 by deanwebb. Mr. Elliott wrote this title in 1902 and complained of how any interest rate, large or small, presented a gradual shift of wealth from the poor to the owners of the banks. A simple, insidious process of concentrating the wealth of a nation into fewer and fewer hands. It’s no wonder that so many people have spoken out against the crime of usury, defining it as any interest charged, as a means of oppression of the poor. Reading in light of today (2011), I cannot help but underscore most of Mr. Elliott’s points. Even if one discounts the divine nature of Christian and Jewish religious figures, one cannot deny their innate compassion for the plight of the poor: it is in harmony with many other leading intellectual and religious movements that value compassion. By allowing usury, we have sealed our fate. Even if we have no direct debts ourselves, we pay the debts of others through the prices they charge on their goods and services, set at such a level so as to clear a profit after paying interest on their debts. No one person can truly be debt free without society itself being debt free. The book is free as an eBook from Project Gutenberg and Amazon’s Kindle Store. This entry was posted in Economics on 04/09/2011 by deanwebb. And so is the sun. But my deaf ears cannot hear it. Then the work of the Lord is done. Those who have read The Grapes of Wrath will really appreciate this poem. This entry was posted in Reason to Live on 04/04/2011 by deanwebb.